The campus scenery at UL Lafayette is changing once again as construction continues on a new building to house the Computer Science Department and the Center for Advanced Computer Studies. The three-level building will be located where McNapsy Stadium once stood along McKinley Street. The $7.5 million structure will feature 15,000 square feet for classrooms, auditoriums and conference rooms on each floor. An official groundbreaking ceremony was delayed because of timing with hurricanes Katrina and Rita. Bill Crist, director of UL Lafayette Physical Plant, said the concrete slab is in place and the steel structure is moving along rapidly. “ The project is running ahead of schedule and should be completed by December of this year,” said Crist. That’s good new to Dr. Magdy Bayoumi, department head for Computer Science and director of CACS. Currently, faculty are housed in the Conference Center which also serves as a dormitory for students. 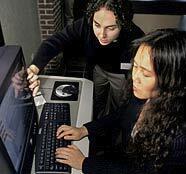 Today there are more than 400 undergrad majors in Computer Science with concentrations in Video Game Design and Development, Cognitive Science, Computer Engineering, Information Technology and Scientific Computing. CACS is ranked in the top 25 nationally in quality of research and in the top 50 in external research funding. Plans at the new building also call for more involvement with private industry. “We want to help attract high tech companies to Lafayette with what we are capable of doing within this high tech environment,” he said. This new Computer Science building is part of a construction boom on campus during the past decade. Other buildings like Moody Hall and Legacy Park are complete while several are in the planning stage. A proposed annex of Fletcher Hall to accommodate the growing College of the Arts could take up the remaining space near the new Computer Science building while Burke-Hawthorne will also be enlarged and renovated. The biggest upcoming project is the renovation and possible expansion of the Student Union. The $31 million project, which will be financed through student assessed fees, will fill in the green space between McLaurin Gym and Guillory Hall and will involve about 50,000 square feet.